The Carefree Gloss Restorer effectively builds the gloss on all floor types whether polished or unpolished as it cleans. Increases the life and durability of emulsion polishes. 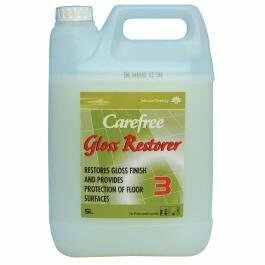 Spray then buff to shine with a rotary floor machine fitted with a tan or red pad. Suitable for all machine speeds.